In spite of a small population, Mariefred is counted as a city due to historical significance. 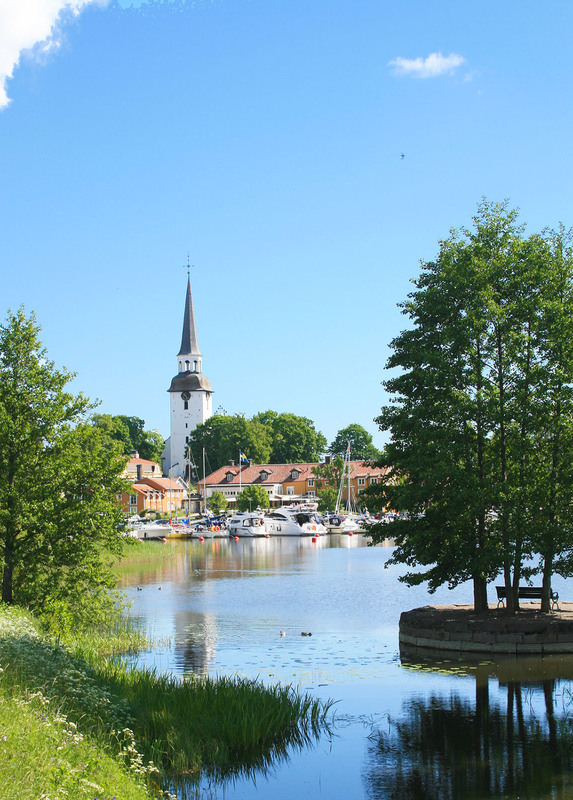 The history of this little city dominated by lovely wooden buildings in the city center dates to the 1370’s when Bo Jonsson Grip built a castle on the promontory, Gripsholm, which after several expansions became the Royal Gripsholm Castle under King Gustav Vasa in the 1530’s. The name Mariefred is attributable to a monastery founded by Carthusian monks named ‘Pax Mariae’ which means ‘Mary’s Peace’ and so the village around it was named Mariefred. Monasterium Pacis Mariae was inaugurated in 1504 in connection with Sten Sture the Elder’s funeral there though his remains were later moved to Kärnbo Church (now a ruin) and finally to Strängnäs Cathedral. In 1526, Gripsholm passed to Gustav Vasa. In accordance with the Reformation in Sweden, the monastery was disbanded. At Mariefred Church are some excavated remains of the old monastery. Mariefred was granted city status in 1605 on June 12 (city’s birthday) thanks to the castle around which it grew. 3 major fires hit the city. The first was in the 1620’s with the next two in 1640 and 1682, when the church burned. During his reign, Gustav III spent much time in Gripsholm and so began the heyday for Mariefred. The monarchy encouraged the construction of factories and Gustav himself established a large distillery. It employed about 280 people and conducted small scale business until the beginning of the 1860’s. A short time later, Mariefred began to stagnate though other cities thrived with trade, factories and shipping. It was a common occurrence in the older cities such as Gränna, Sigtuna and others who came into being centuries before the industrial revolution. They vegetated as ‘charming, sleepy idylls’ quite unmoved by changes in the economic and technical fields. “Mariefred is one of the country’s best preserved wooden towns with plank fenced yards and sheds for small hand crafts” wrote one travel guide. It is because of this stagnation that is true. After the 1682 fire, buildings have largely been spared from demolition which afflicted so many other small towns and cities.